Reserve 2 Tbsp. basil for later use. Combine remaining basil with mozzarella, mayonnaise and garlic. Unfold 1 pastry sheet onto cutting board; cut into 3 strips following fold lines in pastry. Cut each strip crosswise into 4 squares; place on parchment paper-covered baking sheet. Repeat with remaining pastry sheet on second baking sheet. Spread about 1 tsp. cheese mixture onto each pastry square. Top with remaining ingredients. Bake 16 to 18 min. or until edges are lightly browned. Sprinkle with reserved basil. 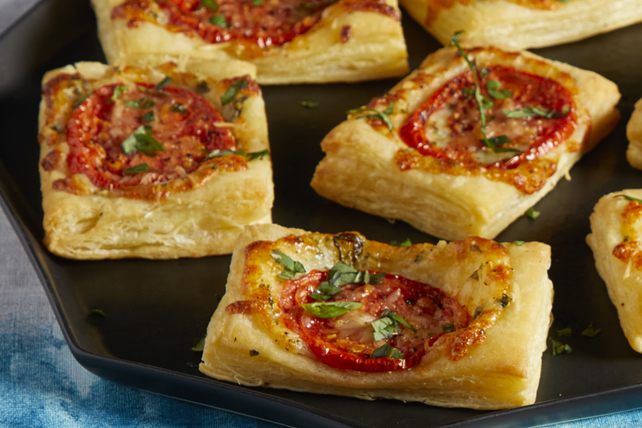 These easy-to-make Tomato-Basil Cheese Puffs can be assembled ahead of time. Refrigerate up to 2 days before baking as directed.